The comparison with string value like “Los Angeles” is not available in calculated values. When using string hierarchies in calculated values, you can use only count aggregation and compare it with numbers. Thanks for the quick reply and providing your data source. Could you please share some additional details about the final result you’re trying to achieve? Insert in columns the field “ESTADO”: show different ‘ESTADOS’ and count them. When double-clicking show detail (drillDown). Insert in columns the field “FINCA”: count number of ‘FINCA’ (regardless of the state). 1. It seems that you have successfully added “ESTADOS” field to the column area and it works as expected. 2. 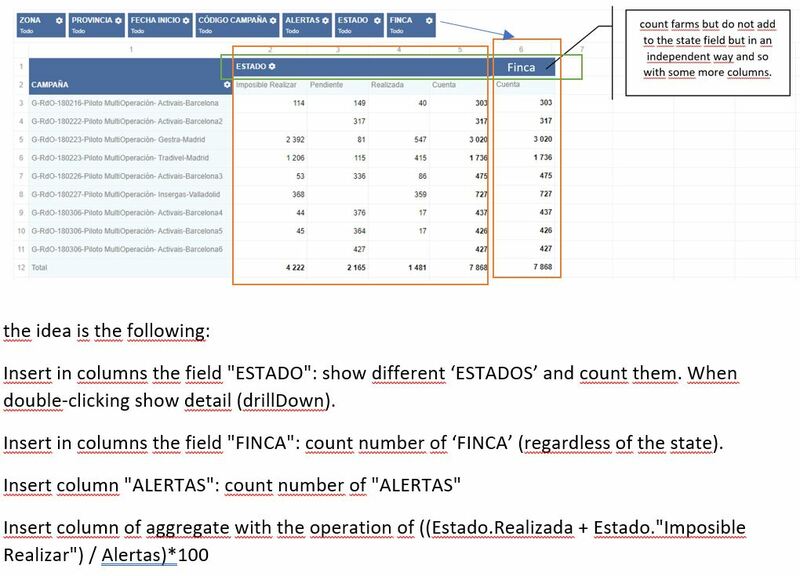 Speaking about adding a calculated value based on “FINCA” field on the same level with “ESTADOS” field, we have to inform you that it is not possible to achieve that due to the architecture of our grid. The architecture of our grid does not support such type of behavior. The only possible workaround here is to show a separate grid with calculated values only and without “ESTADOS” field in the column area. Here is the example: http://jsfiddle.net/flexmonster/rkprvhhs/487/. 3. Here is the same recommendation as for the previous one. It is not possible to add some different independent field on the same level with “ESTADOS” field. 4. Our component does not support such type of formula. You cannot refer to field’s member when writing a formula.